Delhi government launched its ambitious project to deliver public services at the doorstep of residents. From driving licences to marriage certificates, Delhiites can now apply for 40 government services to be delivered at their homes for a fee of ₹50 per service. Former RBI Governor Raghuram Rajan’s note of caution on the next financial crisis that could be building up needs to be taken in all seriousness. Mudra credit, which is basically small-ticket loans granted to micro and small enterprises. lending to farmers through Kisan Credit Cards. What is NPA as per RBI guidelines ? Non-Performing assets in respect to banks are defined as the loans on which interest or principle is not being paid for 90 days. For short duration crop if the loan (instalment / interest) is not paid for 2 crop seasons it would be termed as a NPA. The loans have been sanctioned under the Pradhan Mantri Mudra Yojana, which aims to ‘fund the unfunded’. Given that these are small loans up to ₹10 lakh each, with the borrowers mostly from the informal sector, banks have to monitor them very closely. It is debatable whether banks have the resources and manpower to do this when they are chasing the bigger borrowers for business and, increasingly these days, recoveries. The risk is that these small-ticket loans will drop under the radar and build into a large credit issue in course of time. The same logic holds true for crop loans made through Kisan Credit Cards. Recognition is the first step in a clean-up, and unless banks are cleaned of their non-performing loans, they cannot make fresh loans. Ethanol: A simple aliphatic alcohol formally derived from ethane by replacing one hydrogen atom with a hydroxyl group: CH3-CH2-OH. It is an alcohol derived by process of fermentation mostly from carbohydrates of agricultural residue and feedstocks. As a quasi-renewable energy, ethanol can be blended with petrol or diesel making it a sustainable transport fuel. It will help in reducing emissions and dependency on imported fuel. burning of leftover agro-based produce especially from wheat and rice feedstocks. Benefit farmers economically, as they would be paid for their agro-based produce to extract bio-ethanol. It would also help in preventing the loss of fertility of soil and damage to environment by reducing air pollution. Ethanol blending is the practice of blending petrol with ethanol. Many countries, including India, have adopted ethanol blending in petrol in order to reduce vehicle exhaust emissions and also to reduce the import burden on account of crude petroleum from which petrol is produced. The renewable ethanol content, which is a byproduct of the sugar industry, is expected to result in a net reduction in the emission of carbon dioxide, carbon monoxide (CO) and hydrocarbons (HC). Ethanol itself burns cleaner and burns more completely than petrol it is blended into. In India, ethanol is mainly derived by sugarcane molasses, which is a by-product in the conversion of sugar cane juice to sugar. The Government has unveiled a new National Biofuel Policy (2018) that incentivises biofuel generation through multiple measures. Biofuels in India are of strategic importance as it augers well with ongoing initiatives of Government such as Make in India, Skill Development and Swachh Bharat Abhiyan. It also offers great opportunity to integrate with ambitious targets of doubling of import reduction, farmers’ income, employment generation, waste to wealth Creation. Basic Biofuels: First Generation (1G) bioethanol and biodiesel. Expansion scope of raw material for ethanol production: It allows use of sugarcane juice, sugar containing materials like sweet sorghum, sugar beet, starch containing materials like corn, cassava, damaged food grains like broken rice, wheat, rotten potatoes, unfit for human consumption for ethanol production. Use of surplus food grains: The policy allows use of surplus food grains for production of ethanol for blending with petrol with approval of National Biofuel Coordination Committee. This will ensure farmers get appropriate price for their produce during the surplus production phase. Incentives to advanced biofuel: Viability gap funding scheme indicated for 2G ethanol Bio refineries of Rs.5000 crore in 6 years for giving special emphasis to advanced biofuels. It also proposes additional tax incentives, higher purchase price as compared to 1G biofuels. Supply chain mechanisms: The policy encourages setting up of supply chain mechanisms for biodiesel production from non-edible oilseeds, used cooking oil, short gestation crops. Synergising efforts: It predefines roles and responsibilities of all the concerned Ministries and Government Departments with respect to biofuels to synergise efforts. Status of India’s trade with its neighbours. From 2.86 per cent in 2013-14, India’s combined trade with the seven SAARC nations and Myanmar moved up to 3.56 per cent of total trade. The share of the neighbourhood in total exports increased from 5.72 per cent in FY14 to 7.75 per cent in FY18, with Bangladesh and Nepal pulling up the averages. Bangladesh, Sri Lanka, Nepal put together contributed 13 per cent ($2.2 billion) of India’s total vehicle exports of $17 billion in FY18. India-Maldives trade from $110 million to $222 million over the last four years. Despite problems of accessibility, India-Afghanistan trade increased by 67 per cent to $1.14 billion. India-Bhutan trade was up 82 per cent to $0.91 billion. The government’s outreach to its neighbours included initiatives such as Prime Ministerial visits, resolving long pending issues like Land Boundary Agreement with Bangladesh has helped to stabilise trade. Opening land visa with Myanmar, implementing decade old connectivity proposals, addressing trade logistics issues and offering soft loans and aid at an unprecedented scale also helped India. Though trade was not the only objective of this initiative, it gained prominence in recent years, despite stiff competition from China. In FY18 India-Sri Lanka trade witnessed volatility, India’s vehicle exports to Sri Lanka and Nepal were down 17 per cent and 10 per cent respectively. While Pakistan is an unwilling trade partner, maintaining bilateral trade at around $2 billion for years. Indo-Myanmar trade, which has also been stagnant at around $2 billion for some time, was affected by India’s restrictions on pulses imports last year. How neighbourhood trade strengthens India’s diplomacy? While the political relations between Nepal and India have been rocky, both nations worked at improving trade relations over the last four years. India contributed generously to Nepal’s post-earthquake reconstruction ($750 million aid). India also made progress in improving trade logistics, invested heavily in cross-country electricity infrastructure that helped mitigate the power shortage in Nepal, lined up investments in oil pipeline, and rail connectivity. India-Bangladesh relations are witnessing a steady improvement, with India stepping up its financial assistance programme from $1 billion to nearly $8 billion. Project exports will boost bilateral trade in the years to come, helping India recover some of the lost ground from China. 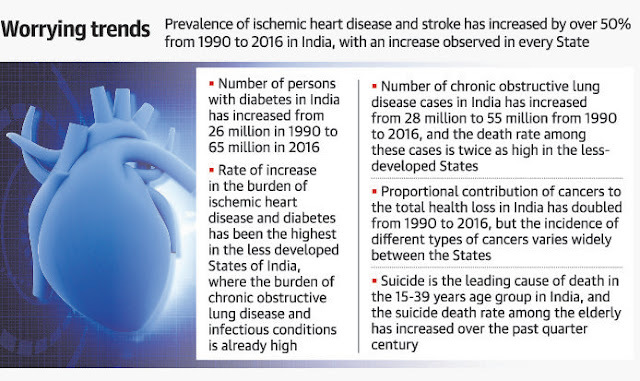 According to the ‘India State-level Disease Burden Initiative’ report Indians have registered a 50% increase in the prevalence of ischemic heart disease and stroke over the period from 1990 to 2016, with the number of diabetes cases climbing from 26 million to 65 million. In the same period, the number of people ailing from chronic obstructive lung disease went up from 28 million to 55 million. The proportional contribution of cancers to the total loss of health in India has doubled from 1990 to 2016, but the incidence of different types of cancers varies widely between the States. The State-wise disease burden showed that Punjab has been ranked at the top for the burden of ischemic heart disease, followed by Tamil Nadu, and vice-versa for diabetes. West Bengal topped with the largest number of stroke cases followed by Odisha, according to the comprehensive analysis of several major non-communicable diseases (NCDs). Kerala was ranked at the top for the burden of cancer, followed by Assam. Being overweight was found to be a major risk factor for diabetes doubled in every State of India from 1990 to 2016. 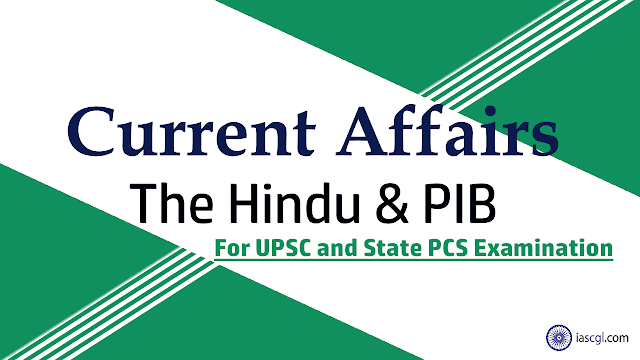 Experts noted that the insights provided by these findings are very timely for the planning of Ayushman Bharat, the National Health Protection Mission announced recently by the Prime Minister. “ICMR is also working at creating a standard treatment workflow for Ayushman Bharat,’’ said Dr. Bhargava. The Council added that they are all set to make public Mahatma Gandhi's health records — general health, blood pressure data, etc. — as part of the 150th commemorative issue of the Indian Journal of Clinical Research. The Union Ministry of Health has banned the manufacture, sale or distribution of as many as 328 varieties of combination drugs in its efforts to keep a check on the irrational use of fixed dose combination (FDC) medicines. The strict step by government is based on recommendations made by a panel of experts formed by the Drugs Technical Advisory Board (DTAB). The panel had said there is no therapeutic justification for the ingredients contained in these FDCs. The expert panel had even flagged off possible risks to those taking these FDCs which are now banned. Citing public interest, DTAB had recommended banning these drugs completely under the Drugs and Cosmetics Act, 1940. In 2016, the health ministry banned these FDCs but pharmaceutical companies took the matter to court. 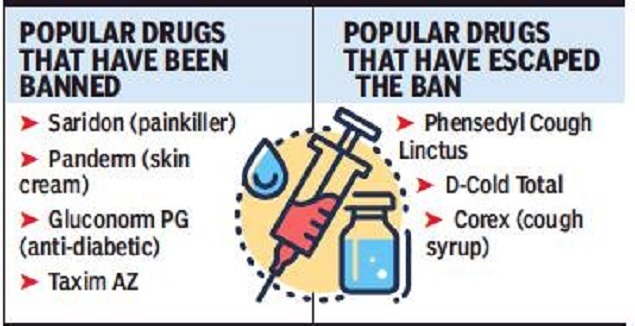 With the ban, popular drugs like Saridon (painkiller), Gluconorm PG (used for diabetes), Lupidiclox (antibiotic),respiratory and gastro-intestinal medicines, covering 6,000 brands.